Have you ever dealt with Hard Drive partitions in Microsoft Windows? Most people use disk partitions just as they were while purchasing the computer. That having said, it’s kind of necessary to create different disk partitions for easier storage. It’s an easy task, unlike most people think. Even if you mess up, there are a few tools to help you. You should know some things like the difference between mbr and gpt while partitioning a drive. Most of you may not know about MBR and GPT. Essentially, they are Partition Structures. That is, every Hard Drive partition you create will have a particular structure. It defines multiple aspects of the partition, like the organization of data, codes required for booting and partition borders. And, mbr or gpt, you have either of the two choices. We’d never recommend a random selection between these because each choice has its own advantages and disadvantages. So, in this article, we will have a detailed MBR vs GPT insight. We hope you need an introduction to both. 5. Is GPT Fully Compatible? 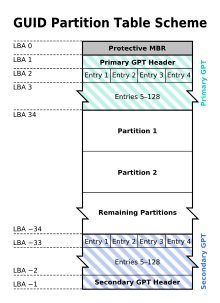 What is GPT and MBR? Introduced in 1983, MBR is one of the widely-used Partition structures. It actually holds the monopoly when it comes to Hard Drive partitions. MBR stands for Master Boot Record and it’s used on multiple platforms like Windows, Mac and Linux. There is a reason why MBR is called Master Boot Record. It’s because, in the beginning of every MBR-based drive, there will be a special boot sector. This sector is used to store different types of information. Essentially, you can find bootloader in there. It’s also containing details about the different logical partitions on the hard drive. For instance, if the drive has 4 partitions, details of each partition will be found in MBR. Although it’s the industry standard since when it was launched, MBR is now being replaced. GPT was developed by Intel in the late 1990s. The major reason was the many limitations faced in MBR. It’s closely related to what is now known as UEFI. GPT Partition Structure is considered to be a specification for UEFI Systems. Obviously, GPT has a lot more differences when compared to MBR. Before we move on to the detailed comparison, you should know some more things about GPT. GPT stands for GUID Partition Table. Here, GUI means Globally Unique Identifier. It means that GPT-based Hard Drives will have its own string. No two GPT partitions in the world would have the same string. So, this has some benefits in the total OS functioning, along with other advantages. Now that you have an idea about both GPT and MBR, we’ll discuss the advantages and disadvantages. Earlier, we told you that MBR Partition Structure is quite old. It also means that you can still find a big bunch of devices that are based on MBR. Well, the noticeable issues with MBR Partition Structure are as follows. There is a limit to the size of Hard Drives in MBR partition structure. You cannot use it in devices that have a bigger size than 2TB. That is, if you have a 4TB Hard Drive for your system, you cannot set that up using Master Boot Record. You can create only 4 Primary Partitions using MBR. There are times when you need a higher number of primary partitions in the device. In comparison, MBR Drives aren’t really reliable. Due to corruption and other issues, MBR might get overwritten, causing some other issues as well. It’s because MBR-based drives are storing all data in a single location. These issues were enough compelling for Intel to create a new partition structure – and we have GPT. Now, we will check out the bright side with GPT-based drives. Here are some of the reasons why you have to create the next partition in GPT. There is no particular limit to the size of Hard Drives you can set up with GPT Partition Structure. It’s good enough if you have a bigger size HDD in the computer. For instance, if you are setting up a rig for gaming, you’d surely need something more than 2TB. GPT supports up to 128 Primary Partitions. When compared to the 4 in MBR, this is something huge. 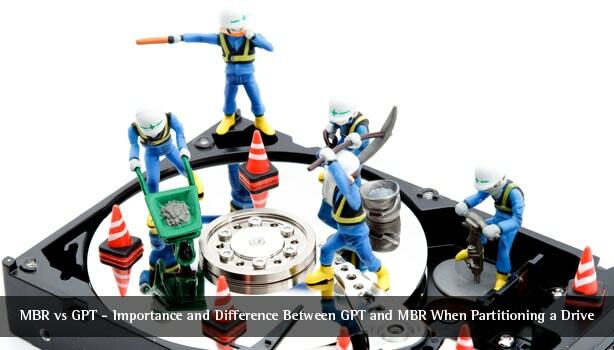 When compared to MBR, GPT has better reliability and protection. There are a few reasons for this. First of all, boot data and partition data are stored in multiple places in GPT Partition structure. Even if something happens to one, there are methods for recovery. GPT-based Drives will perform Cyclic Redundancy Checks for the booting and partition data stored. If the main data is being corrupted, the drive will try to do the recovery by copying data from other locations. On the other hand, in MBR, you have to do that manually. Cutting the story short, GPT will offer the benefits of better size support, a number of partitions and the lack of data corruption. In other words, GPT has fixed everything that was wrong with MBR. But, shouldn’t we take a look at the aspect of compatibility? You don’t have to worry about compatibility when you have chosen GPT as the partitioning structure. There are two reasons. First, almost all the popular computing platforms have support for GPT – such as Windows, Mac and Linux. By the way, if you want to boot an OS from a GPT-based drive, your PC should be powered by UEFI. The second reason is more awesome. Every GPT-based drive has something called Protective MBR. It’s used to make the drives compatible with MBR-only devices out there. So, if you connect the GPT drive to an MBR-only device, the drive will seem to have a single partition. This is used to prevent the overwriting of data by the device. That is, if a drive is found un-partitioned, it will be overwritten by a new MBR. In short, no matter what you connect it to, GPT Drives are super-compatible. You don’t have to worry about the loss or corruption of data. Isn’t that awesome? We hope we have explained well the differences between master boot record vs GPT. At the end of the day, the choice is simple: just go with GPT. You get better reliability, support and there is no need to worry about the aspect of compatibility either. All of these sound awesome for us; what do you think? If each hard drive will be uniquely identifiable, are there any privacy issues with this? I think it’s not possible because each partition are identified with unique GUID.